Soldiers of the Libyan UN-backed government forces gather on a street in Aziziya, Warshaffana, Libya, on Nov. 10, 2017 hours after taking control of the largest military camp in the area. Picture by Hamza Turkia/Xinhua News Agency/PA Images. All rights reserved.Frustrated by the lack of media time given to local Libyan reactions to international actions, I have just finished a project funded by the Remote Control Project to interview a wide range of local stakeholders (including civil society activists, businessmen, officials, Islamist leaders, former ministers and former fighters) to elicit views on the less-well known but ongoing international military intervention in the Libyan conflict since the NATO campaign to topple Gadhafi ended in 2011. The responses highlighted the “damned if you do, damned if you don’t” dilemma faced by governments currently seeking to contain the spread of violent extremist groups in the country and protect their own security. On the one hand, foreign intervention has generally elicited a negative response in Libya, where pride in national sovereignty and mistrust of international intentions run deep. Then, on the other, there is a keen sense of abandonment following the ousting of Gaddafi – when the international community left the country vulnerable to meddling by a wide range of local and regional actors. It is, perhaps, unsurprising then that many western countries discreetly continued military operations in the country after the official end of the NATO mission in October 2011. However, their interests and motives – particularly their perceived focus on countering terrorism over the broader stability of the country – have been a cause of contention. Alongside diplomatic efforts to build support for the Government of National Accord (GNA) (created with the intention of forging a consensus ruling body in Libya – an aspiration that has failed), there are reports that the US, France, Italy and the UK have or have had Special Forces on the ground in the country. This engagement peaked after 2015 when, so called, Islamic State (IS) declared the coastal town of Sirte as its Libyan headquarters – just 396 miles off the coast of Italy. As chaos and division in the country continue to increase, foreign intervention appears to be inadvertently exacerbating divisions on the ground, adding further layers of controversy and suspicion to an already complex situation. While there was an uneasy local acceptance of the 2011 intervention to bring down Gaddafi, subsequent foreign interventions have prompted shrill reactions inside Libya. For example, in July 2016, after it was revealed that French Special Forces were operating in the east of the country, hundreds of Libyans took to the streets of Tripoli, as well as other western towns to condemn foreign involvement, holding up placards that proclaimed, "Get your hands off Libya" and "No French intervention." Recent comments by British Foreign Secretary, Boris Johnson, who stated during a meeting on the fringes of the Conservative party conference in October 2017 that Sirte could become the next Dubai once it had "cleared the dead bodies away", only served to amplify such suspicions. More importantly, through its intervention, Britain has inevitably become bound up in the complex local power struggles that are tearing Libya apart. 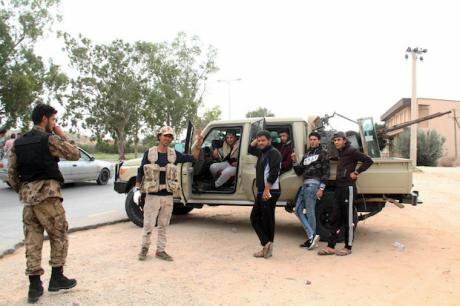 By backing the GNA in its battle to oust ISIS from Sirte, the UK gave the strong impression that it was supporting one side in this conflict at the expense of others. Although the GNA was conceived of as a consensus government, its rejection by some of the key forces on the ground meant that it was never anything of the sort. Nor was it ever officially approved by Libya’s elected parliament, the House of Representatives, meaning that in the eyes of many Libyans, the GNA remains an illegitimate body. Yet, in another sense the UK is damned if it doesn’t engage. Despite the dominant narrative that rejects foreign intervention, there is clearly a lot of bitterness about the way in which Libya was left to its own fate once Gaddafi had been toppled. There is clearly an appetite in Libya for international support, as long as it is perceived to be focussed on helping Libya as a whole and not just on tackling groups like ISIS or dealing with the migrant crisis. Within this vein, another issue to emerge strongly from the responses was a sense that by turning its back on Libya, the international community had left the country to the mercy of regional players. Many flagged up the roles played by Egypt, the UAE, Jordan, Qatar and Turkey, who have all played their part in Libya’s conflict, backing different factions to the detriment of peace and stability. Indeed, Qatar and Turkey have backed the Tripoli and Misratan camps, while Egypt and the UAE have stood firmly behind Haftar, providing him with political support, as well as military training and assistance. While many of these comments reflect a somewhat contradictory position in which the international community is damned if it intervenes and damned if it stands back, there is clearly a strong feeling of resentment inside Libya that the country has been subjected to a barrage of meddling and ill-thought through interventions, none of which has had Libya’s interests at its core. This is exacerbated by the secrecy and ambiguity over the intentions of intervening countries. Ambiguity and lack of transparency create hearsay and fuel accusations, drawing interveners into the local dynamics of the conflict, making it impossible to be seen as an apolitical or non-partisan player. This cannot help but undermine diplomatic action. In the case of the GNA, the international intervention only fuelled accusations that it was little more than a puppet government, created by external powers and serving a foreign agenda. Such accusations weakened it further and chipped away at its legitimacy. If nothing else, my research underscores the need for greater transparency, so that international actions and intentions can stand up to the scrutiny of the many competing local groups that will need to be brought onside if Libya is to see peace. Check the full report “After the fall: Views from the ground of international military intervention in post-Gadhafi Libya”.